Well maintained, two owner 55' Fleming Motor Yacht PATHFINDERwith low hours, reliable Caterpillar engines, twin 12kW Northern Lights generators, Naiad stabilizers and bow thruster. Solid fiberglass hull construction in conjunction with its low profile classic design makes this one of the finest cruising yachts in her class. Duty paid and can be USA registered. 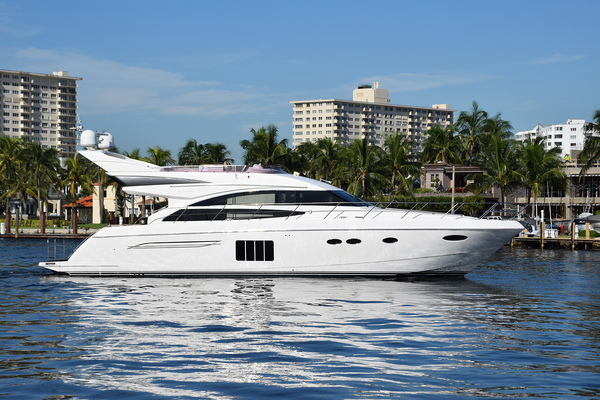 United Yacht Sales New Jersey would love to guide you through a personal showing of this 55' Fleming Phmy 2000. 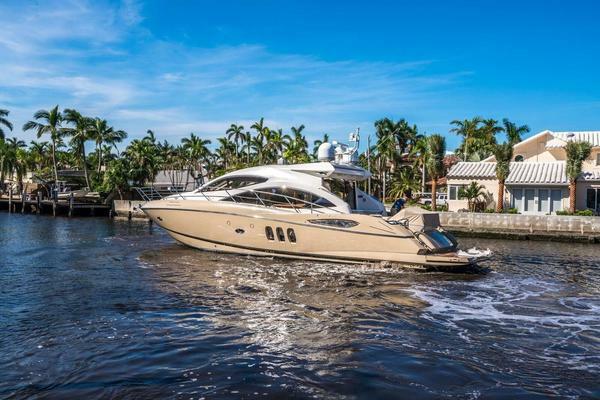 This yacht for sale is located in Fort Lauderdale, Florida and priced at $740,000. For a showing please contact us by filling out the form on this page and we will get back to you shortly! Entering the salon from the aft deck through the double doors you are immediately impressed by the spaciousness and ambiance. The attention to detail and exquisite handmade teak raised paneled cabinets give rise to feelings of warmth and relaxation. The 16' beam provides space enough for dining and lounging areas and great care has been taken to balance scale with function. The open floor plan of the salon encompasses the galley and dining area which can comfortably seat six.Along the port side of the salon is a settee anchored by a wet bar aft. The starboard side includes an entertainment center hidden behind a teak cabinet, ample storage and two barrel chairs to Starboard. The spacious galley has Corian counter tops and is equipped with double bowl sinks, waste disposal, convection microwave, dishwasher, ceramic three burner cook top with custom potholders, and a full-size refrigerator with ice and water dispenser. A storage compartment just forward of the cook top accommodates a full range of saucepans. A locker and small pantry on the starboard side provides additional storage and a convenient serving counter for morning coffee. The accommodations layout features a central passage which has proved to be so desirable over many years in the Fleming 55. This layout contributes to an easy and convenient flow of traffic through the boat as well as making it possible to appreciate the full length of the boat from forepeak bulkhead to transom. The arrangement provides bunks to starboard, a VIP guest cabin to port and an en-suite master stateroom forward. The accommodations are dressed with teak and Formica and offers great comfort and convenience without any steep stairs to negotiate.Centrally located in the passage, behind a sliding teak door is the Asko full-sized 220V washer & separate dryer.The master stateroom includes a queen island berth with two skylights. Ample storage is accomplished via a large cavity underneath the bed that is accessed through gas assist struts. Additional storage is found via his and hers hanging lockers, drawers, & book shelves.A 34" Samsung TV and Sony BluRay Player is also mounted on the bulkhead.Both master and guest heads are exceptionally spacious with generous glass and stainless steel shower enclosures. Each head contains Hansgrohe thermostatic controlled fixtures and Corian countertops along with one piece molded fiberglass stall showers.The port stateroom has twin berths with a convenient shelf outboard. Storage is provided through a large hanging locker and drawers underneath the berth as well as built-in shelving along the aft wall. The starboard stateroom features bunks with a slide out upper berth. Hanging locker, drawers and bookshelves provide ample storage for gear. In many modern designs it has become fashionable to eliminate the inside steering station, but the Fleming 55 features a pilothouse which closely resembles the bridge of a much larger vessel. Fleming created a dedicated place from which the boat is piloted and controlled without any distractions from other on-board activities but which is still only three steps from the salon and galley. Four interior steps safely lead to the upper flybridge station.Specially designed removable consoles provide ample room for a full range of modern electronic equipment without intruding on the full range of engine instrumentation. Overhead consoles provide additional space. There is also a proper chart area with drawers and a chart light. Both AC and DC electrical panels swing out to provide easy access to wiring connections and the inside of the flybridge console is accessed through a swing-out bookcase. The raised L-shaped settee and table provide a comfortable social area with excellent visibility through the side and forward windows.Visibility forward and to port and starboard is excellent, and the two sliding doors open to the wide side decks. The traditional teak and holly sole is standard. There are large drawers and working space for charts, cruising books, and navigation instruments, binoculars and everything else a captain needs to chart and follow a safe course. A large stainless steel teak-trimmed destroyer wheel fits the ambiance of this ultimate cruising yacht. The flybridge is easily accessed from the pilothouse or by ladder from the cockpit. The two seater upper helm is located to port and provides excellent visibility particularly in close quarters and bustling harbors. The electronics console houses an array of engine instrumentation & navigation hardware with easy access via a hinged bookcase behind the settee in the pilothouse. The starboard side of the flybridge features a U-shaped settee with a large fixed table while the port side consists of an additional seating area and access to the dumbwaiter. The table top to port can be lowered and the seating pulls out to make an additional bed. In common with all Flemings, the hull is hand laid solid fiberglass reinforced with a grid of stringers and frames. Vinyl ester resin is used below the waterline with further protection provided by epoxy barrier coats. A reasonable 5' draft allows for Bahamas cruising while ensuring that the running gear is protected by a full-length keel which is foam filled and glassed across the top to isolate it from the hull.Special attention has been paid to the ease and safety in which the heavy duty ground tackle is set and retrieved. The anchor platform accepts two anchors, each of which can be controlled by a handheld unit at the platform or by windlass controls at the flybridge station.On deck she has the familiar walk-around decks we are used to seeing on all the Flemings and the high bulwarks and Portuguese Bridge provide security for both children and pets. Four gasketed and lockable hatches provide access to the engine room and spacious lazarette. The engine room is accessed from a hatch aft of the salon doors through the outside leading down to the well laid out engine room. Systems and engineering are a notable feature of all Fleming Yachts whose philosophy has always been to choose only the best equipment available for the job and make sure that it is readily accessible for maintenance. To achieve the extremely low sound and vibration that Flemings are known for, Aqudrive systems transfer the thrust directly to the hull and isolate the engine by using soft engine mounts.The lazarette houses the water tanks, steering gear and air conditioning compressors while also leaving ample room for storing cruising gear such as spare anchors, rode, lines, fenders, and parts. Having the A/C compressors located here instead of in a hot engine room improves performance and efficiency and minimizes noise. Additionally, all battery isolation switches are accessible from outside the engineroom.